Troy Transportation Moving and Storage offers storage options for all your storage needs. We have state of the art facilities at all of our major locations, and can offer you further storage options at your request. We can tailor to your short or long term storage needs. 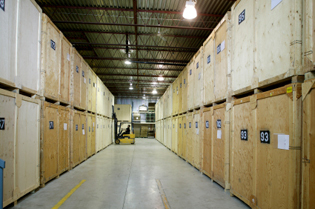 Whether you require storage in Vancouver, Calgary, Toronto or Montreal, we can offer you storage services at your request. WE OFFER 4 WEEKS FREE STORAGE SERVICES WITH ALL LONG DISTANCE MOVES!!! Our storage facilities are designed only for our moving customers. This guarantees that we take full responsibility for your household goods while they are in our possession unlike public storage facilities. When picking up or dropping off something at your storage room, we dedicate one of our moving personnel to supervise this and add/remove the items onto your prepared inventory list. FREE blanket rentals while your goods are in storage; your goods will remain wrapped and protected as performed on the pick-up until delivery takes place at no extra cost! FREE Re-delivery from our storage facility to your new residence with any long distance move. SPECIAL!!! 2 MONTHS FREE STORAGE WITH ANY 12 MONTH OR MORE COMMITMENT!!! Start Today and request a FREE QUOTE for your Move and Storage needs!